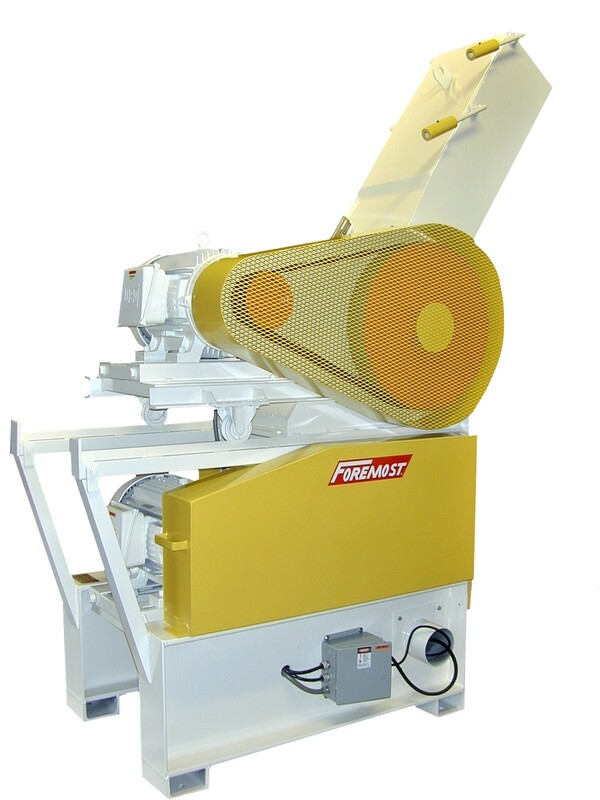 Dual Stage Granulators – DSC- 18 – Foremost Machine Builders, Inc. The patented Model DSC-18 Dual Stage Granulator offers an improved, high output first cutting stage, plus modular flexibility to meet a wide range of processing applications. You can use Foremost’s standard HD-5B Granulator for a second stage; or replace it with any model you choose. Dual stage granulators use two separate cutting chambers. The first has a solid cylindrical rotor embedded with 18 disc-shaped cutters which shave off small sections or pieces of the solid lumps loaded in the hopper. The greater the weight of purgings on this rotor, the higher its output. The DSC-18 upper stage uses unique disc-type cutters. Their concave “cutting circle” has been optimized through extensive engineering analysis to achieve maximum output at the lowest power requirement. Since just one quarter of each disc is used for cutting at any time, a new keen surface can be easily revolved into place simply by loosening a single hold-down bolt on each disc when it dulls. In this way, four fresh surfaces are available on each cutter before the disc must be removed for resharpening. And since the knives rest in machined seats in the upper chamber rotor, no gap settings are ever required. Knife access is obtained by pivoting the hopper to one side.